Mr David Morfesi, Executive Director of the Institute of International Trade said higher education, already Australia’s most valuable services export, is set to grow under the China-Australia Free Trade Agreement. 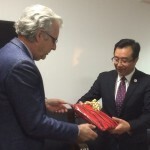 and UIBE, captures not only the gains achievable in higher education under the China-Australia Free Trade Agreement, but creates a bilateral collaboration producing the next generation of economic, business and cultural leaders who will have a heightened understanding and appreciation of one another,” Mr Morfesi said. 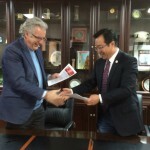 UIBE is a leading institution and the degree will be highly valuable to students interested in building capabilities to do business with China, and to work with partners from China in Australia and around the world. 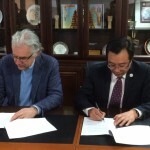 Professor Christopher Findlay, Executive Dean of the Faculty of the Professions, and Professor Han Weichun, the Dean of the School of International Education at UIBE, signed the agreement in Beijing this week. Professor Findlay said programs like this will give students a significant advantage and ‘on the ground’ experience and exposure to the Chinese market. “The University of Adelaide is committed to building key partnerships like this to offer students programs relevant to current and future employment opportunities,” Professor Findlay said. The program consists of two years studying at the University of Adelaide and two years at UIBE, and participating students will graduate with a Bachelor of Commerce from both institutions. The UIBE part of the program will be taught in English and students can nominate to take part from their second year at the University of Adelaide. Students interested in the program can join one of the Faculty of Professions’ many China study tour options for a taste of studying and working in China. This entry was posted in News, Study and tagged Bachelor of Commerce, China, Commerce, Double Degree, Free Trade Agreement, University of Adelaide, University of International Business and Economics. Bookmark the permalink.